Package contains 24 "I have.. Who has..?" cards. 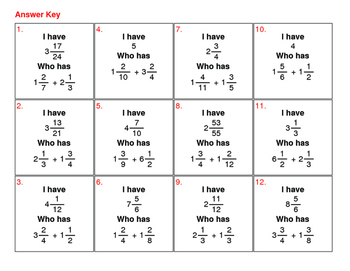 The answer key is included so you can follow along as the game is being played and be able to help a student who is stuck on an answer. Print on cardstock, laminate and cut out each set of cards. 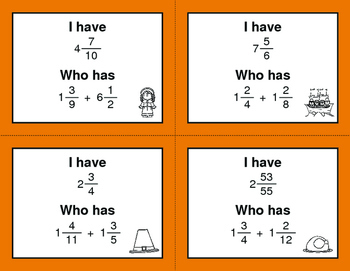 This activity is perfect for small group instruction or as a center activity. There are no specific start or end cards. Directions: Pass out randomly the "I have who has" cards to students. Some students may have more than one card. Pick one of the students to start. They should read their question to get the activity started. The person that can answer their question then proceds to read their answer. 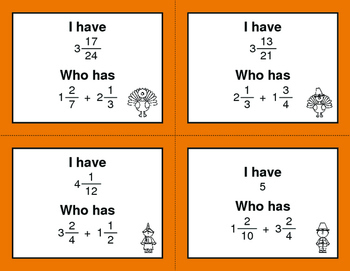 The activity continues until the first person reads the answer on their card. 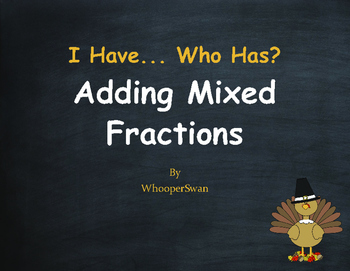 Please CLICK HERE to view other THANKSGIVING MATH products!